Sergio and I, two dads with young children, founded YumEarth out of our commitment to feed our families a diet rich in delicious honest foods. We love dreaming up mouth-watering treats that burst with yum, a combination of our award winning flavors and our dedication to the finest ingredients. Our world famous YumEarth gummies, fruit snacks, licorice, lollipops, and other treats are honestly crafted with our legendary flavors and are gluten-free so everyone can enjoy. Thank you from Rob and Sergio! YumEarth Naturals Sour Beans are delicious and absolutely perfect for Easter! Jelly beans are probably one of my favorite candies ever and let me tell you YumEarth Naturals Sour Beans do not disappoint. I love the flavors and honestly think they taste amazing! I love that YumEarth Naturals Sour Beans contain no artificial colors, flavors and are made with real fruit juice. 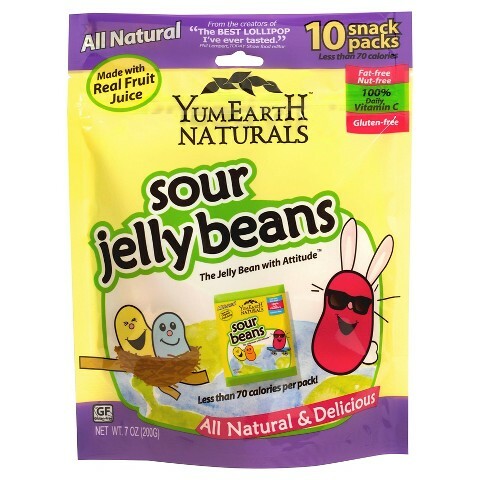 YumEarth Naturals Sour Beans make the perfect candy this Easter for both kids and adults!